Kfm 94.5 - Competitions - Does your pup have talent? Win with #PupIdol! Does your pup have talent? Win with #PupIdol! Pups are cute, but they’re even cuter when they’re talented. 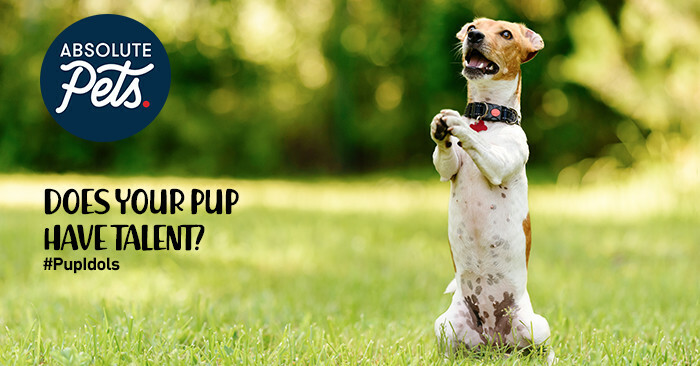 This week, your pup’s talents could win you your share of R6000 CASH and Absolute Pets vouchers worth R5000, thanks to Kfm 94.5 and Absolute Pets. If your doggie can dance, shake hands or even sing – WhatsApp a 20-second video of your pup showing off his or her talent to 082 536 1 536. Then catch the Flash Drive, this week at 5:40pm to see if you’re a winner! #PupIdols with Absolute Pets. Helping you keep your pets Happy and Healthy. Only on The Kfm Flash Drive. Editorial: Other than the sloppy licks and chewed shoes, or that new ‘scratchy’ look for the couch, pets also provide you with unconditional love and loads of cuddles. That’s why Absolute Pets is passionate about helping you provide the best care for your four-legged member of the family. As the leading pet care retailer in South Africa, our knowledgeable and friendly pet care advisors in store offer expert advice on nutrition, suitable toys, and grooming options. Visit absolutepets.com to find your nearest store. Absolute Pets. Helping you keep your pets Happy and Healthy. This competition runs from Monday the 5th of November 2018 to Friday the 9th 2018 on Kfm 94.5. To participate in the competition, listeners must WhatsApp a 20-second video of their pups showing off its unique talent to 082 536 1536. From Monday to Wednesday, Carl Wastie will profile 1 #PupIdols finalists and award them with R1000 in cash & a R1000 voucher from Absolute Pets. The 3 finalists’ videos will be posted on Facebook on Wednesday the 7th of November for listeners to vote for their favourite #PupIdol. On Friday Carl and the team will announce the winner of the #PupIdols. The winner will receive the title of #PupIdol, R3000 in cash and a R2000 Absolute Pets voucher. The prizes are not negotiable, not transferrable, and cannot be exchanged. The judge’s decision is final and no further discussion will be entered into. Kfm 94.5 and Absolute Pets will not be held responsible for any SMS charges, data charges or phone costs incurred while participating in this competition. Kfm 94.5and Absolute Pets will not be held liable for entries not received for any reason whatsoever and will not be responsible for network connectivity or hardware issues experienced while participating. A participant will not be able to win this competition if they have won a prize on Kfm 94.5 within the past 90 days, whether on-air, online or via any of the station’s social platforms. If a winner chosen does not comply, their entry will be disqualified, the prize will be awarded to the runner-up. If a winner cannot be successfully contacted, is ineligible to accept the prize, or contravenes the terms and conditions of this competition or of Kfm 94.5 and Absolute Pets, the prize will be forfeit. Primedia Broadcasting will notify the winner from where and when the prize can be collected. Employees of Absolute Pets, Primedia Broadcasting and their immediate family and friends, are not permitted to enter the competition. All prizes are not transferable.